‘Petit engines agricole‘ is what they’re called and they are the bane of the motorist’s life at this time of year, these slim little tractors dotting the roads of southern France, chugging along with their cargo of grapes. Just narrow enough to drive between the rows of vines, just wide enough to make overtaking on country roads a nightmare. Then there are their larger siblings with their ‘picking arm’, which prevent overtaking completely, unless the motorist is prepared to take life in hands. The Languedoc-Rousillon region has over 740,000 acres laid to vines and is the biggest wine producing region in the world. 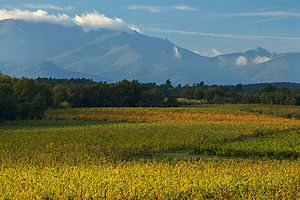 From Montpellier in the north to the Pyrenees in the south one cannot get away from the fields and fields of vines. 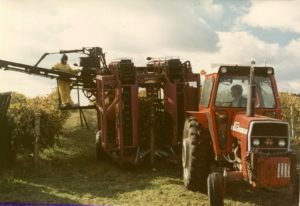 The resulting wine ranges from Picpoul de Pinet ( once bone dry white, but now, unfortunately, getting sweeter to appeal to the wider market ) to the sweet and gloopy muscats of Rivesaltes and includes well-known denominations, like Fitou and Banyuls. Many are produced by co-operatives and there is a multiplicity of caves which comprise the Corbieres and Minervois appellations. We tried quite a few of them recently when visiting friends there, including the Rocbere from the village cave, which will forever be called ‘magic rose’ in our house. Some of the oldest vines in France are to be found here, mainly of the Carignan grape. This region was first producing wine in Greek times, five hundred years BCE. 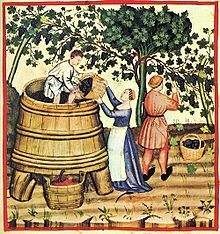 There is plenty of evidence of wine production in Roman times, as we found when we visited Narbonne, which, as Narbo Martius, claims to be the first fully fledged Roman town outside of Italy. The Musee Archeologique there, sited within the Archbishop’s Palace complex is very informative and has large collections of Roman mosaics and murals, ceramics and votary objects, many centred on wine and the grape. They are displayed in the very fine 13th century palace, with its ancient chapels and painted, coffered ceilings. The 13th/14th century Cathedral of Saint Just et Saint Pasteur is linked to the palace, with its forty metre high choir and embellishments desecrated during the Revolution. 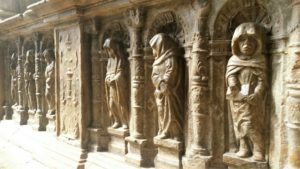 It was clearly advantageous to have a marble tomb rather than a stone one, because the statues and bas reliefs on the stone tombs are faceless, but those on the marble tombs have survived (not that their occupants would mind). Here I came across some of the glummest looking statues that I’ve ever seen. Take a look at the monk on the right, clutching his book. Make him slightly taller and he’d be a dead ringer for Puddleglum the Marshwiggle*. The Cathedral dominates the sky-line for many miles around, but places of interest can also be found beneath the ground. The Horreum, a series of barrel-vaulted galleries, built in the 1st century CE as storage rooms for traders from the nearby Forum market, is now well below street level ( although they were probably basements even in Roman times ). Some of these were certainly wine cellars. There’s also a piece of the Via Domitia on show in the Place de Ville, about ten feet down. Surprisingly, Narbonne has a connection with Al Andalus ( other than wine, of course ). The city was, for a while, part of the Ummayad empire and many prominent Jews settled there after expulsion from Baghdad. Narbonne was renown for its Jewish Talmudic and linguistic schools in the 12th and 13th centuries. 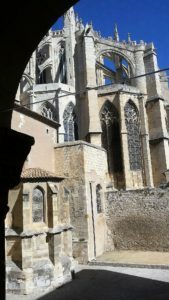 We spent a whole day in Narbonne and saw but a small part of what is on offer. The Pass Narbonne, costing fifteen euros per person, admits you to seven different venues, including some we didn’t have time for. It’s definitely worth buying and visiting them all.